Don’t worry, I am under no illusions. I realise that you guys already find me somewhat irritating. I comment on the old Book of Face a little too often, I find myself far funnier than anyone else does, and I “Tweet like nobody is listening” – mainly because most of the time they aren’t. 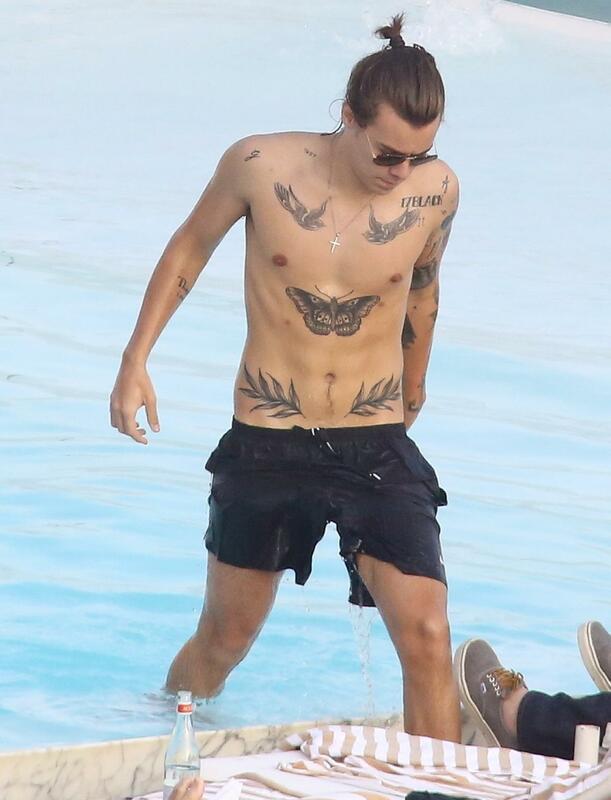 On a scale of 1 to Kimye, who are being particularly annoying at the moment, I would place myself around a solid Harry Styles. Seemed ok at first, now getting a tad carried away, but (hopefully) will get less bothersome and more attractive with age. The answer to the age old question: What happens when you give someone £100million and a Sharpie? My relationship with social media is much like my relationship with KFC. At the time it is a great idea, I am the wittiest person on the planet. Check out me and my hilarious yet self-deprecating status! Then 2-3 hours later I am filled with regret, I feel bloated and sick and curse the day I ever met the Colonel. Now I am “on board” with the whole social media shindig, which by the way is anything but social, there are a few things I would like to say. 1. What are these “*”? I know I use these a lot – see above. But what the hell are they? As far as I can tell it is a ridiculous way to say what you are physically doing only with a dash of irony and lashings of ginger beer. Why do you need to know this? 98% of the time I’m lying to you anyway. I don’t even know what a soapbox would look like. Then again, if I did say what I was doing you wouldn’t be too happy about it, so I’m willing to keep up the charade if you are. 2. Dear people who take selfies. Stop taking selfies. It’s not just the pure self-confidence that I am lacking, sadly I failed my audition for Cirque Du Soleil as I am unable to contort my body into the requisite selfie pose. One friend actually put her back out the other day in the quest for selfie perfection! By far the most prolific offender is the sleeping selfie. You guys are the worst. Unless you have some weird medical condition where you take photos of yourself in the middle of a REM cycle, you ain’t fooling anyone. If you truly were asleep your mouth would be open, your fake eyelashes would be down your cheeks, and you’d probably be drooling. This is the online equivalent of watching MasterChef. Yes, your steamed seabass with pomme puree and edible flowers looks lovely, but not when I have just sat down to a bowl of Mild Curry Super Noodles. Super Noodles are currently retailing at a noodle-icious 79p – available from all good corner shops and some car boot sales. 4. What time is it? Time to put your phone down Soph! To the guy or girl who had the idea to put a clock on Facebook and Twitter. I hate you. Yours Truly may like the occasional wine. I know, it’s shocking. On account of my lifelong lack of relationship this often leads to me being alone in the flat, a little bit tipsy, and with only my Facebook status for company. 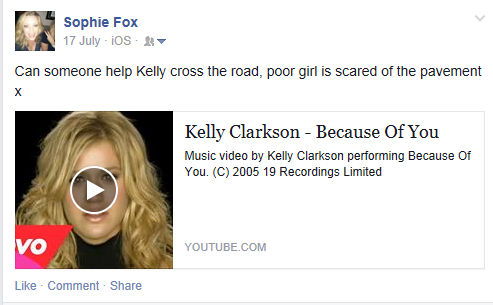 Note to self – when you post a Kelly Clarkson themed status update at an ungodly hour of the morning, people will notice. Because nothing says “Out on a School Night” quite like a 4am attempt at sarcasm. Posted at 03.29 on 17.07.13. wow. Twitter and Facebook can be cruel, especially if, like me, you happen to make jokes a lot. If we are face to face and I say something mildly humerous, it is polite manners to acknowledge the joke with a chortle, a small grin or even a roll of the eyes. In England we are taught this from birth along with how to make a good pot of tea and the best way to discipline ones household staff. Facebook doesn’t give a hoot about manners (damn Yankees). If I make a joke on Twitter all I get in return is silence. They may as well reach out of the screen, poke me in the eye and stick a post-it on my face that says “Must Try Harder”. Just think where would the ice bucket challenge be without Facebook? You’d all be weirdoes having short showers in the garden and not telling anyone about it. I say “you” as I have yet to do this. (Sorry Lauren and Danielle). I’ll get round to it I promise. Just as soon as I get washboard abs and the ability to fit into a bikini. And a bucket. And some ice. Whilst it is for a very good cause, the whole thing may have got a tad out of control. The other day I donated £10 a month to the Red Cross so they can go and keep old ladies company. I know, I’m practically a saint! Also, it is pretty much guaranteed that I’ll need this service myself in the future, so it really is an investment. Unfortunately things went a bit downhill when I celebrated my newfound charitableness by grabbing the nearest container and tipping the contents all over myself. It’s amazing how much mouldy food you can fit in a kitchen bin these days. 7. So what’s the effing point? Seen as my current readership is essentially my dad (hi Pops), the lovely girls from work, and my current Facebook friends you may wonder what on earth was the point of SSW’s page. Well, Dear Reader, much like the lottery, the odds of winning substantially increase if you actually buy a ticket. 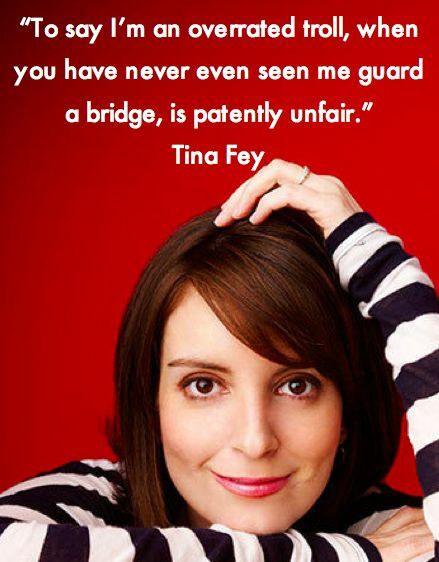 Ergo, the chances of Tina Fey discovering my blog, writing a sitcom based on my life, catapulting me to stardom and meaning I don’t need to move back in with my parents, are greatly improved if this blog has a Facebook page. Such is life in 2014. – If you like my page on Facebook I might allow you to stay in my Tina Fey-shaped Hollywood mansion, but only if you have at least one profile picture you didn’t take yourself. – Maybe empty the bin more often. « Q: What Happens When a Fox Goes to a Festival On Her Own? Thanks! Will definitely check out your blog. From one new-ish blogger to another – good luck. Enjoy it! “pops” here. That’s so American. Soph ! A bit like ” Hi Honey , I’m hommme” SSW is a great read but I would say that wouldn’t I. Who will get to play Sophie in the film adaptation. I’m going to ask Al Pacino to play me (pops) . Thanks for reminding me why I quit Facebook and will NEVER go back (for more than the occasional five minutes when I need to check up on someone or my daughter insists I have to view the latest addition to her photo album). Ah but there is a lot of Facebook stalking that can be done in a mere 5 minutes! I’ve got it to a fine art. Just be careful of the dreaded Like button when on someone’s facebook you shouldn’t be! Ha ha ha! But no – your blog is one of the few things I’d have enjoyed getting. Nice to know I don’t have to be on FB for that! My gawd. I think you just named everything I hate about Facebook. I’ll let you into a secret- I’m actually mildly addicted to fb. Don’t tell anyone! I am, too, sadly, but there I still plenty of things I find annoying about it…like everything you mentioned here. This is just AMAZING! You funny lady you! Yay on the twitter… I think. I got my twitter account a while back, it’s grown tumbleweeds ever since! I can never find anything witty to say, nor I can I think of anything remotely interesting. Yep! 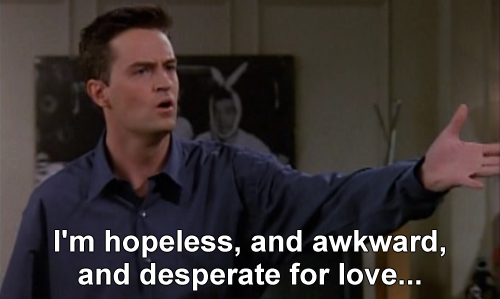 I pretty much such at twitter! Oh my! That bed selfie. That’s taking the pretending-to-be-asleep-selfie p***! How can one sleep while standing, cradling a stuffed dinosaur and holding up a phone? Not realistic at all… Not even in the slightest! Shame on him. I’m glad you led me over here – I think your blog is pretty cool. And hey, I’m not your father, Facebook friend or your work colleague! Yay! Amazing!! Glad you popped over – and also glad you’re not my dad! 😃 I really don’t know how twitter works but sod it – if it’s good enough for Stephen Fry it’s good enough for me! !